Such a fabulous take on a classic. 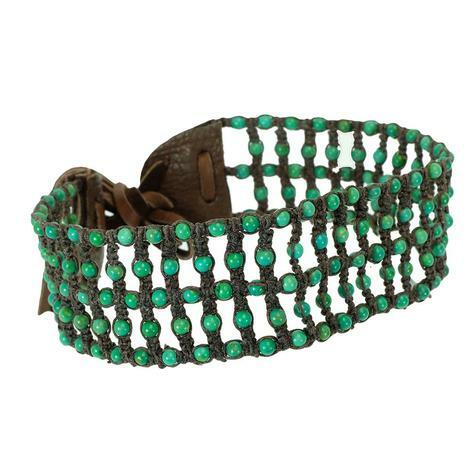 This is a superb brown leather ensemble beaded with five strands of turquoise stones. 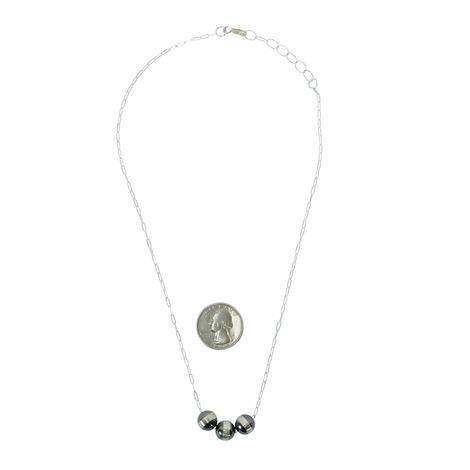 Most defiantly an attention grabber and such a chic accessory you will want to keep in your collection. 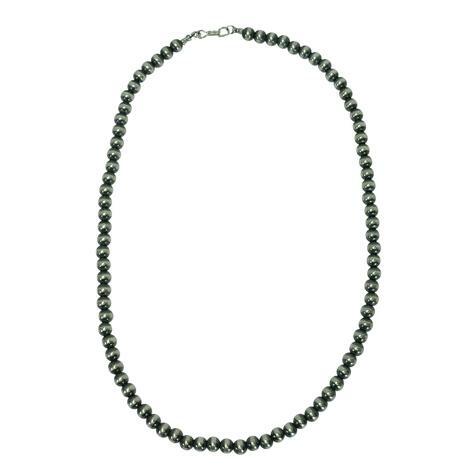 You can't go wrong with a universal high-quality Beaded necklace. 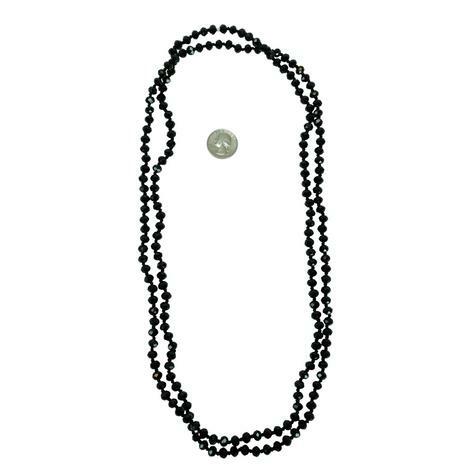 You can throw these on with your favorite t-shirt and jeans for around the stock show or with a dress at a concert. You will be able to match this look with anything and get all your favorite colors! These Pearls speak louder than words! 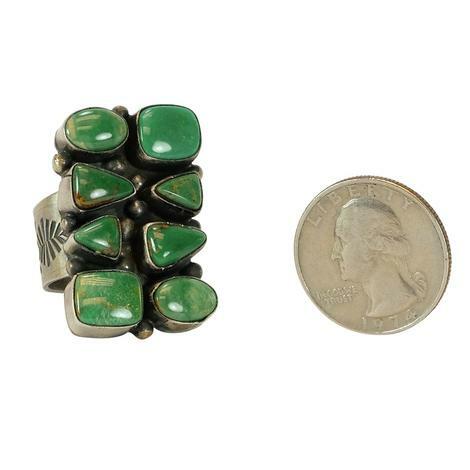 These beauties are hung around a Sterling Silver chain and are handmade by Navajo Indians. What a testimony towards fashion. 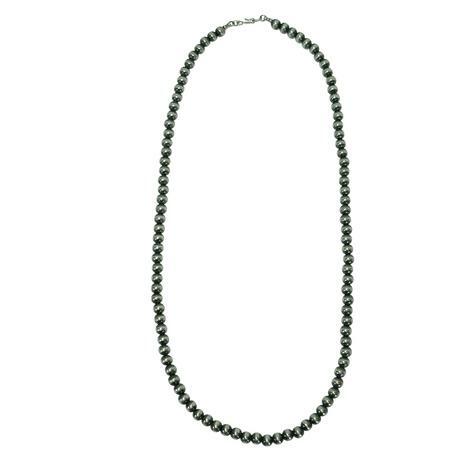 This is a timeless necklace that you will want to keep wearing over-and-over again. 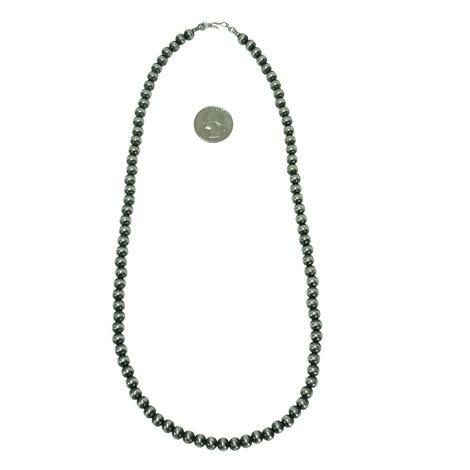 Length End to End: 20"
Adding this rare find to your jewelry box is going to be something you will want to do! 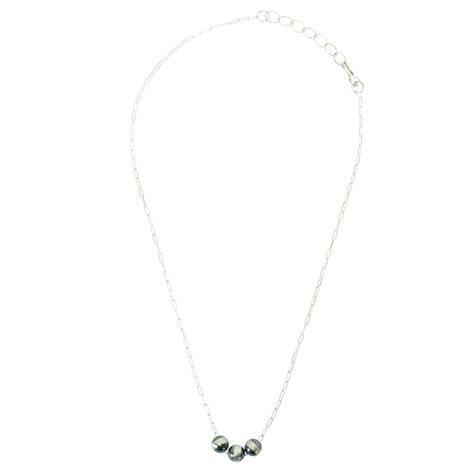 With its unique chain style and 3 bold sterling silver Pearls, it's a great new take on a timeless classic. 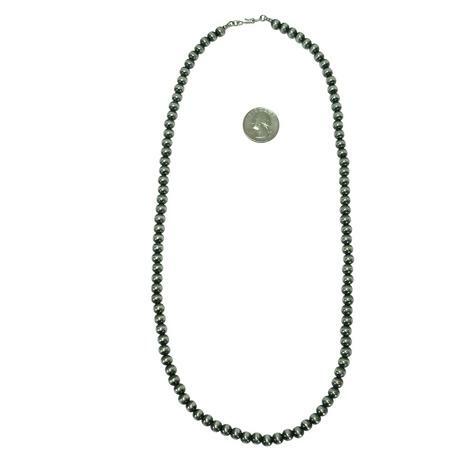 It will absolutely be a statement necklace that everyone will notice. Giving you some verity to the everyday usual. 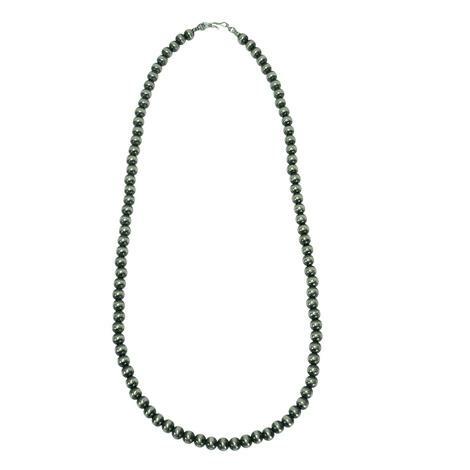 If you are wanting to leave an entire room mesmerized by your style and grace, then this is the necklace for you! 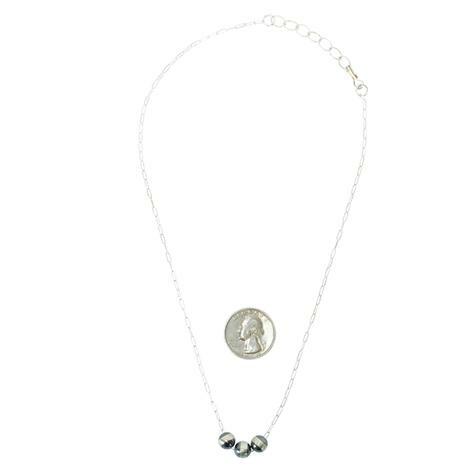 It has a beautiful and different approach on the traditional Sterling Silver chain. 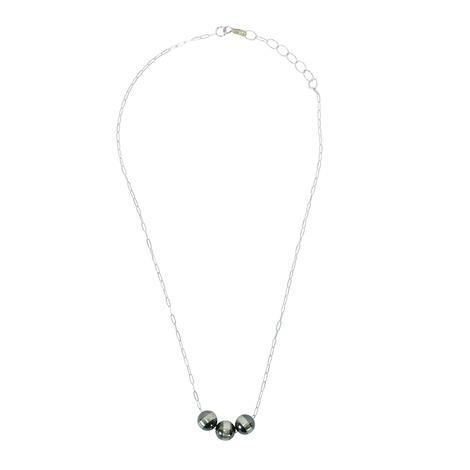 Hosting 3 Sterling Silver Pearls that will undoubtedly drop a jaw or two! 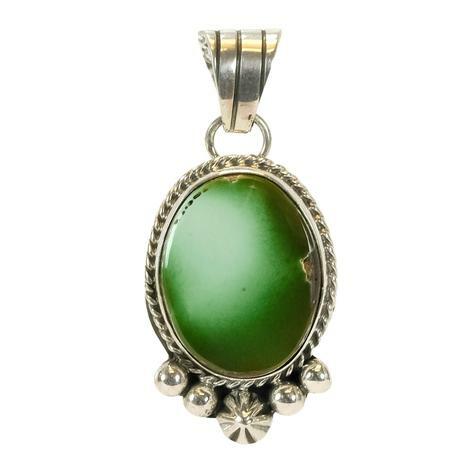 Express who you are with this flattering, wardrobe-friendly, oval stone circular pendant. 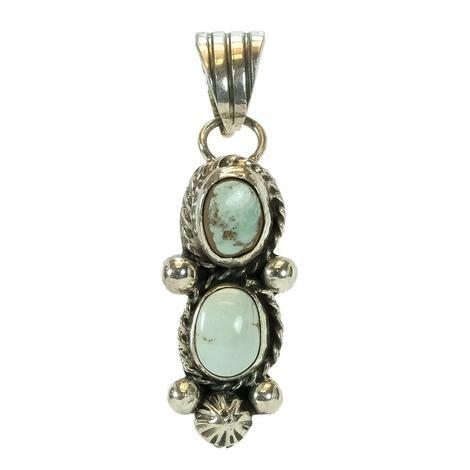 This unique design with multi-dark turquoise stones is sure to be the on-set of conversation. Jewelry is like ice cream, there's always room for more! 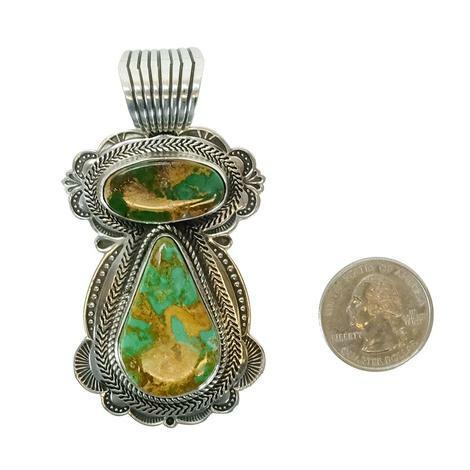 This yummy pendant has seven completely unique authentic turquoise stones. 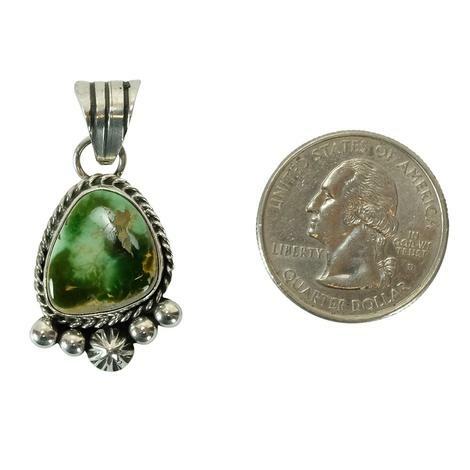 This is a great add-on to your favorite Navajo pearl necklace. 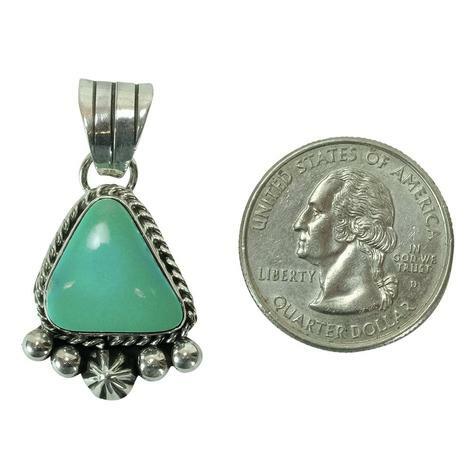 Handmade from Navajo American Indians. 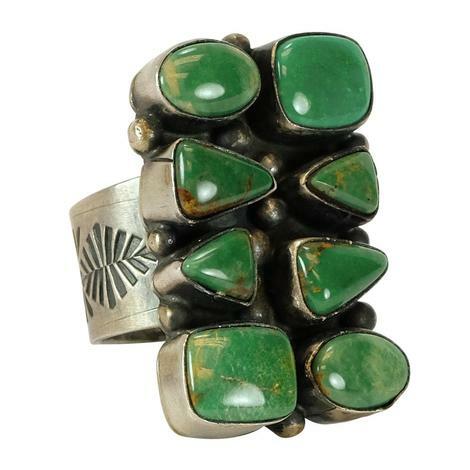 Jewelry is a very personal thing, it should tell a story about the person who's wearing it. 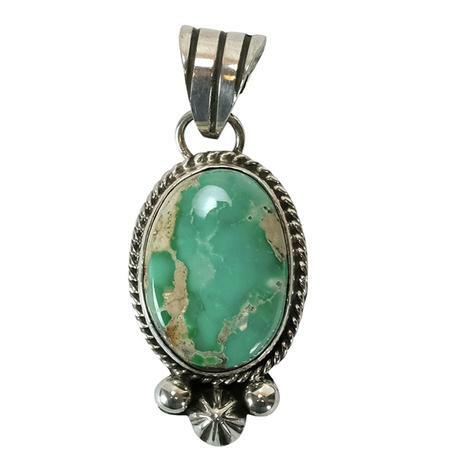 This pendant tells a beautiful and elegant story, with the light green authentic turquoise stone and the handmade sterling silver setting it's a world-class piece all its own. 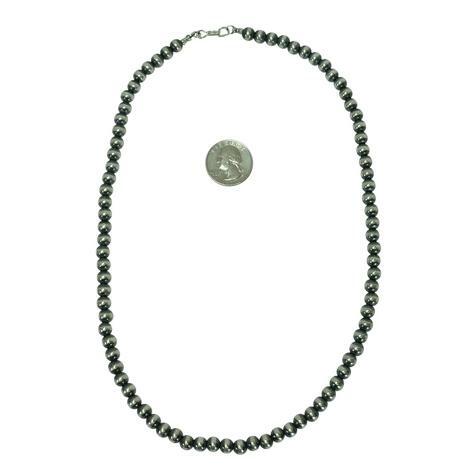 Wear it on a stunning Navajo Pearl necklace to leave a timeless story. 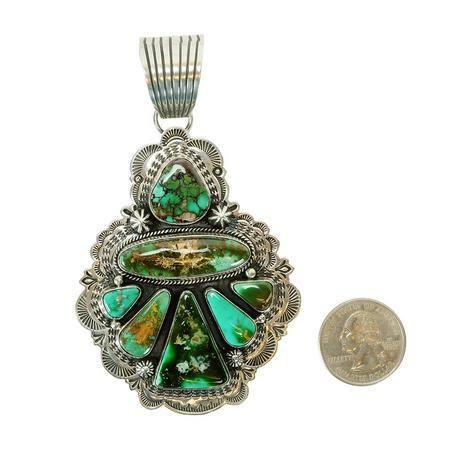 A girl can never have enough jewelry and this is going to be a pendant you need to add to your collection today! 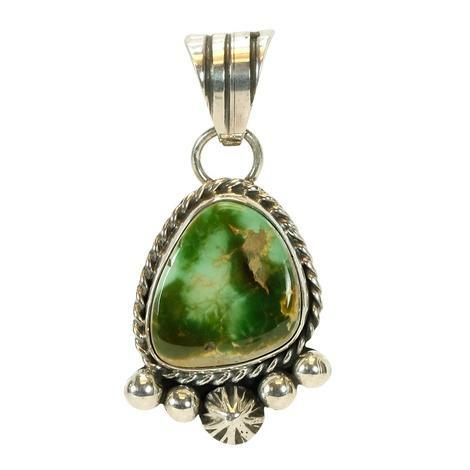 It is an authentic double turquoise stone in a deep green color with hints of amber. 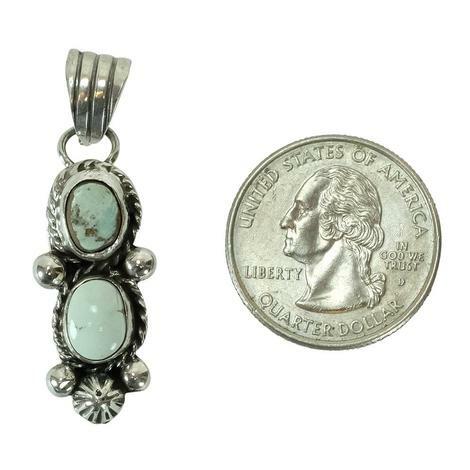 The sterling silver setting is going to give this pendant the complete finished looks, it matches beautifully on a Navajo Sterling Silver Pearl necklace. 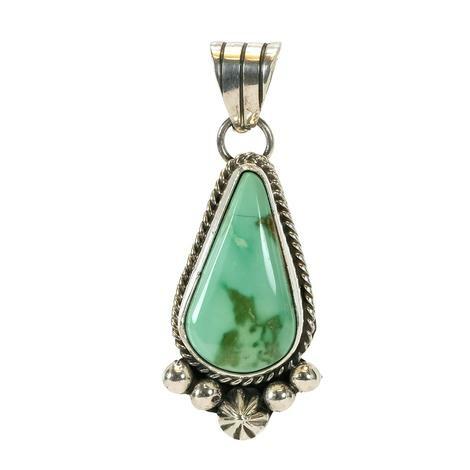 Every piece of jewelry tells a story and this piece tells a beautiful one. 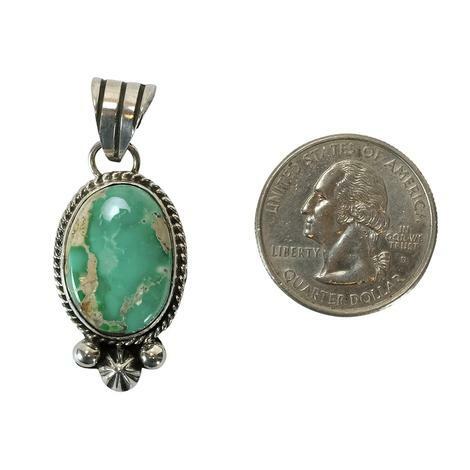 Featuring a completely unique and authentic turquoise stone in a sterling silver casing. 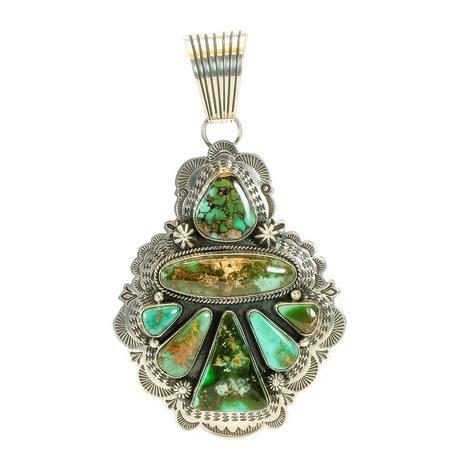 This pendant is truly handmade and made with such high quality its dripping with grace. 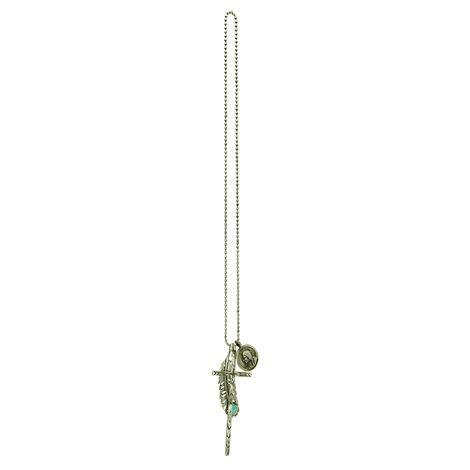 Jewelry has the power to be this one little thing that can make you feel unique; this pendant is no exception. 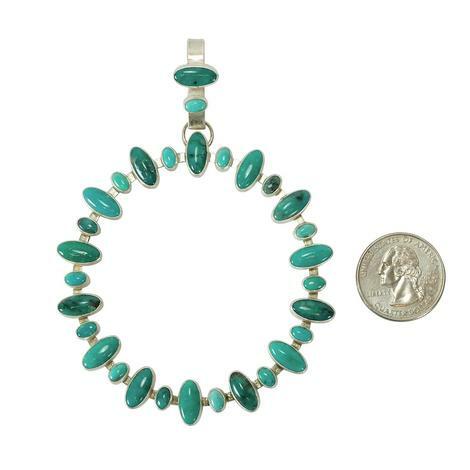 Each stone is authentic turquoise and each is entirely unique. 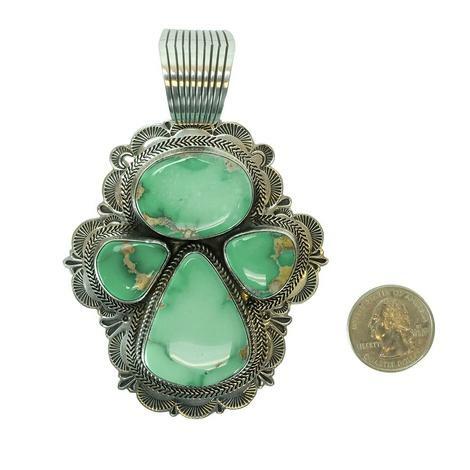 Add this to your treasured Navajo pearl necklace and turn heads where ever you may go. Accessories are the exclamation point of a woman's attire! 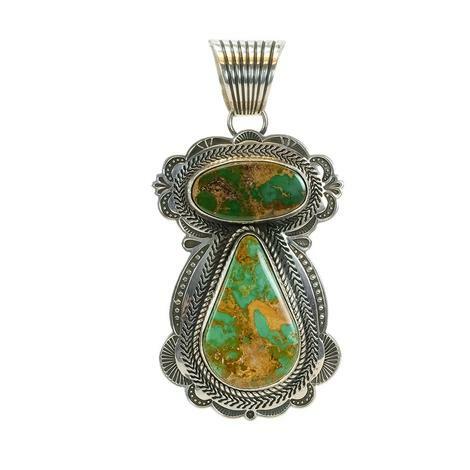 What a breathtaking exclamation point it is, from the authentic turquoise stone to the genuine sterling silver setting this pendant will be a keep-sake. 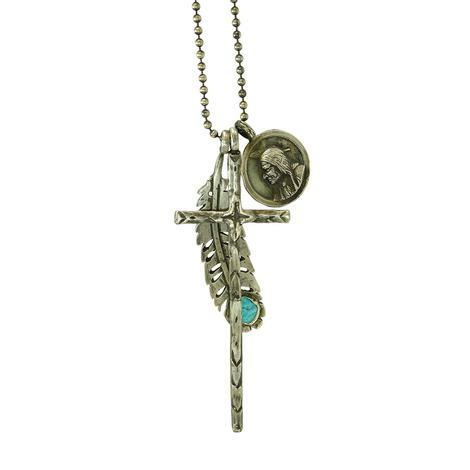 This piece is handmade with total grace making it truly unique. Stones may vary. Accessories are like vitamins to fashion, and you need this vitamin for survival! 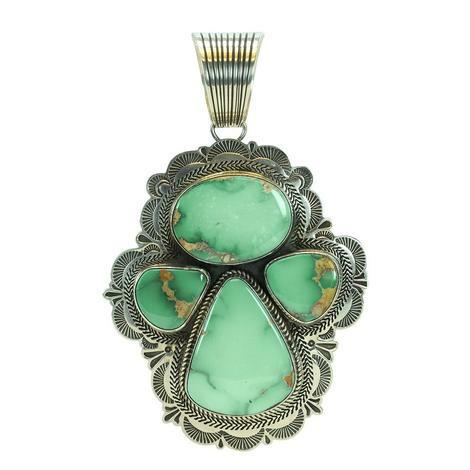 It is a spectacular pendant that features two lovely authentic turquoise stones in a handmade sterling silver setting. 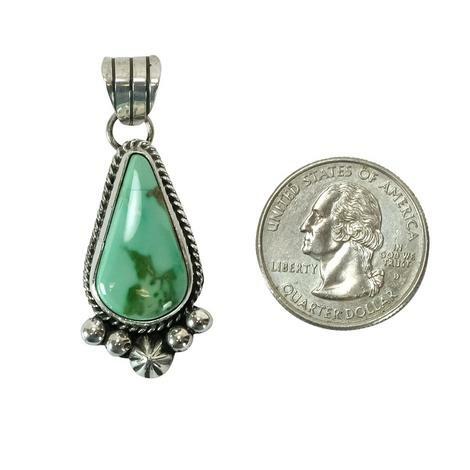 This pendant is completely unique and going to give you a polished look to any attire. Fashion is what you buy, style is what you do with it. 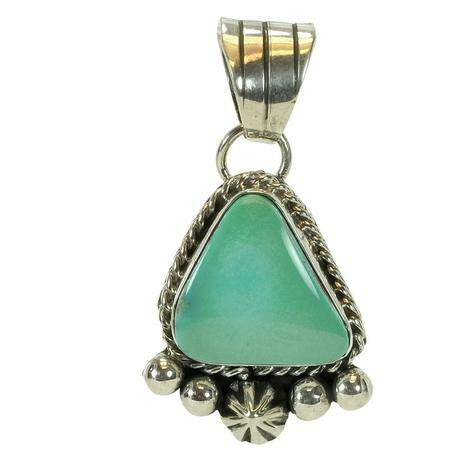 Bring out your uniqueness with this sterling silver multi-light green turquoise oval pendant. 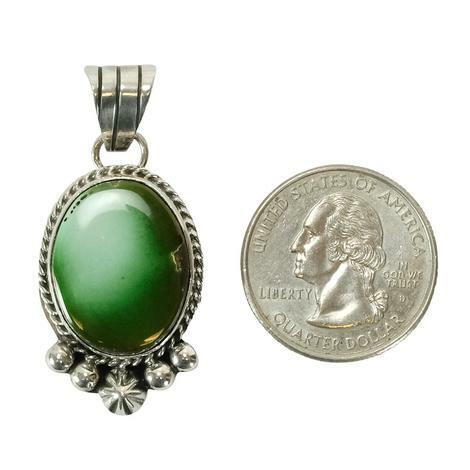 Rock this wardrobe-friendly sterling silver oval stone pendant. 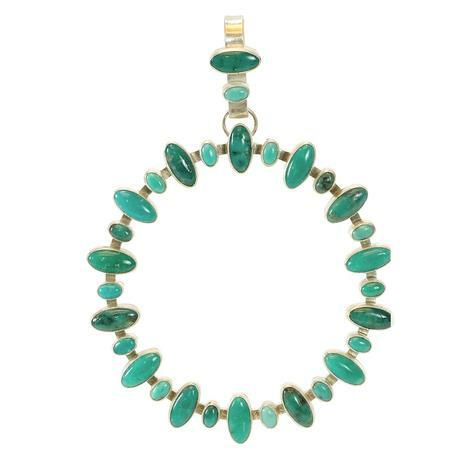 The dark green turquoise is casual, yet elegant, and sure to be the center of conversation.